I had a great idea this morning... and then realized that there was an open source project already doing it. I thought: instead of using specific testing frameworks for each UI technology I have (a tool for the web, a tool for SWT UIs, etc) what about a tool that could recognize the text on screen and click or type in the proper places. The same technology for everything type of UI, and something that doesn't rely on pixel perfect positioning to work! Turns out (surprise!) I'm not the first one that had the idea, and looking around I stumbled on Project Sikuli. This looks great: it uses images to find "interesting" parts of your UI and there's also support for text recognition. So potentially you could say "click on the button that says 'Submit'"! It integrates with Java code so you can easily have JUnit tests using it. Unfortunately, for my own purposes I couldn't get very far easily because of lack of support for transparent images (or, more precisely, it takes into account transparent areas for images, so it doesn't recognize an image if the background changes, which happens if your desktop theme changes, if you use the same icon in different contexts in your UI, etc). But it still looks like a promising tool! This view lets you see the list of packages you've installed, with their version, or the full list from Hackage, that you can filter by typing the prefix of the name you're looking for. From there you can install the packages as either Global or User, see the package information, or click on the "More Information" link to open the Hackage page directly. You can also update the list. This GUI is only a wrapper above the cabal list and cabal info commands. Hopefully this will be useful to people! Should I add a text field somewhere to be able to specify more options to cabal install, or is that overkill for a GUI? A while ago I was wondering how I could enhance EclipseFP, regarding things like memory usage, support for multi components projects, etc. I now have a working version for adventurous testers! The main thing is the removal of Scion. EclipseFP now uses another backend component called "buildwrapper". There is no server, buildwrapper is only an executable that can be launched with flags, and writes a JSON result on the standard output. This means no more huge memory usage, and less synchronization headaches. Buildwrapper uses a copy of the project inside a hidden folder. This means that when we want to get say build errors on a dirty editor content, we can write the dirty content to the file inside the hidden folder, and launch a build process on these files, thus avoiding the limitations that the GHC API has on building from a StringBuffer (doesn't work for files requiring preprocessing, etc). We only use the GHC API to get the types of things in a source file, but we use Cabal to build the project. 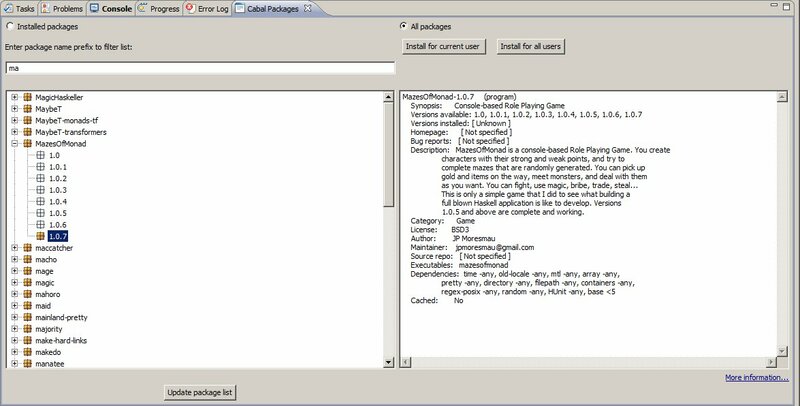 Buildwrapper actually launches the cabal executable and parses the results. I know, sounds crude compare to an API only approach, but I have the feeling it just works better. Basically the IDE will now behave a lot close to what you get if you were building your project from the command line. And then you get additional goodies, like multi component support (so you can have the executable of your project reference the library in the same project, and it works!). Buildwrapper uses haskell-src-exts for outline. I've actually seen cases where it needed language pragmas to parse correctly that GHC didn't need, but such is life. Performance seems to be quite good, except for things that use the GHC API, where there's a little lag. Hopefully the fact that we don't use gigs of memory any more will make up for it. I'm also thinking about distribution. EclipseFP came with Scion and Scion-browser bundled, if only because we used a different version of scion than the one on Hackage. I think that moving forward we'll rely on cabal install and Haskage. I'm going to add a simple interface to run cabal install inside EclipseFP, so you shouldn't have to go outside to install a package. So the EclipseFP preferences will just ask the user for the path to the buildwrapper and scion-browser executables, with an option to install them from hackage. If people want to start testing, just go on github, and grab the BuildWrapper repository (main branch) and the EclipseFP project (buildwrapper branch). For the moment, BuildWrapper probably only builds on GHC 7.0. Once I have the feeling it's robust enough and there's no big flaw in the new architecture, I can work on enhancing portability.